Andrea Dezsö is a visual artist who works across a broad range of media including drawing, painting, artist's books, embroidery, cut paper, animation, sculpture, site-specific installation and public art. Dezsö's permanent public art has been installed in two New York City subway stations, at the United States Embassy in Bucharest, Romania and at CUNY BMCC Fiterman Hall in Lower Manhattan. Community Garden, Dezsö's mosaic in the New York City subway was recognized as Best American Public Art in 2007 by Americans for the Arts. Dezsö exhibits in museums and galleries around the world. She is Associate Professor of Art at Hampshire College in Amherst, MA and maintains studios in NYC and in Western Massachusetts. OPTIONAL: students may bring their own preferred collage materials, color pencils, markers, etc. Throughout history, humans have told stories to entertain, share knowledge, and illustrate events of the past with words, text or imagery. 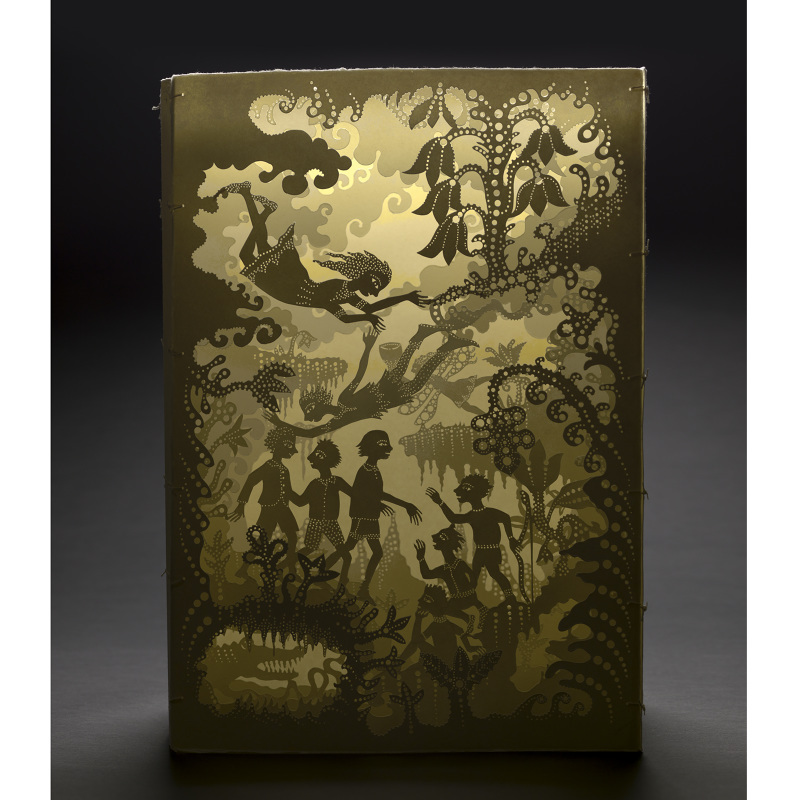 In this workshop, you will explore story-telling and bookmaking in a whole new way. 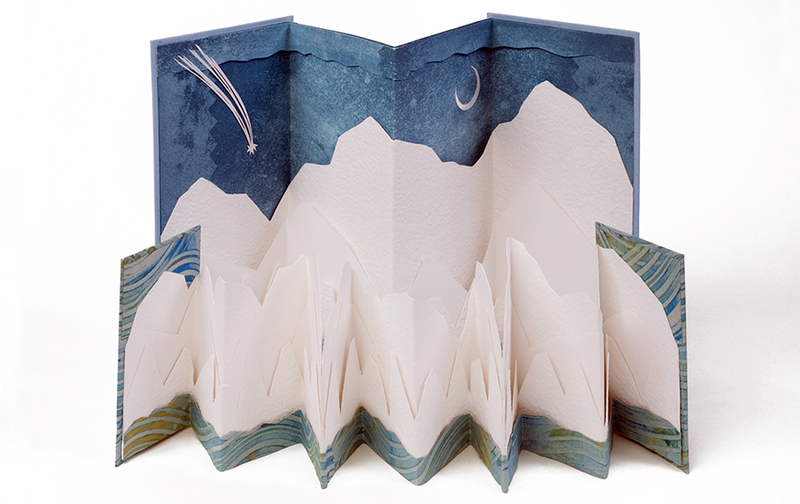 Accordion books are a relatively simple structure for a book that gives many options to expand in all directions. They can be long, short, tall, and wide, but they always fold up easy. 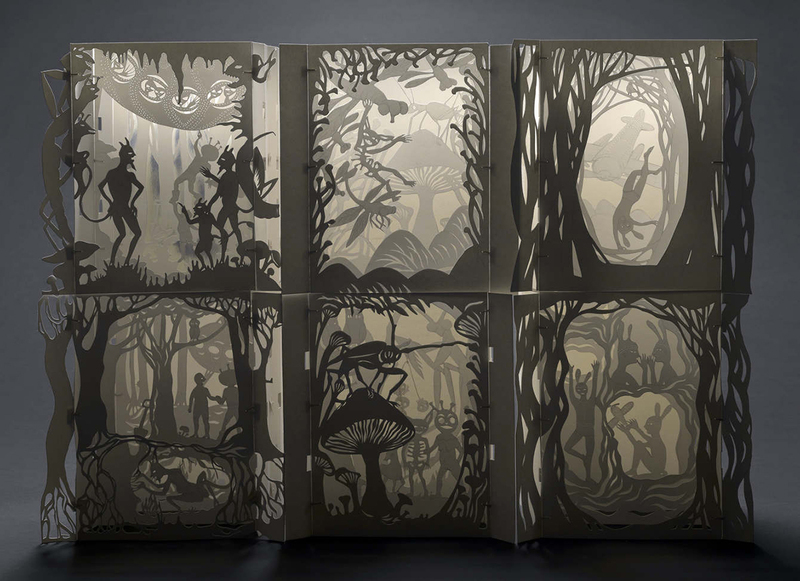 We will be exploring illustration, page layouts, and pull-outs to create a story within an accordion structure. We will also make a few test books to get familiar with the multiple variations of accordion books and everyone will have the opportunity to choose their preferred structure type. Out of all the different methods we use to tell stories, writing and books have almost always worked together, but for this workshop our goal will be to tell a story without the use of words! What is a story that you would like to share? Angel Simoneau holds a BFA in Art Education with a minor in Book Arts from University of Southern Maine. Her work primarily consists of manga, which is the Japanese word for ‘comics’. 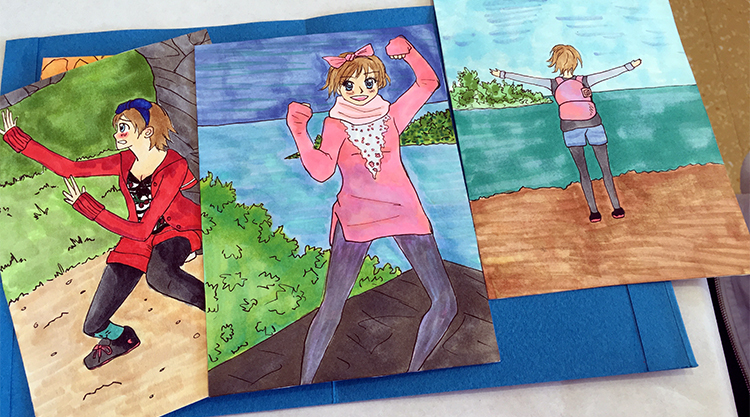 During her college career she was able to explore Book Arts and apply her knowledge and passion with manga in the books she created. Her favorite book format is the Accordion. Often, her books focus on her experiences and the various places she has visited, primarily Japan in 2015 and France in 2017. Teaching is Angel’s primary source of enjoyment and accomplishments in life. She has worked with all ages and hopes to one day have an art classroom of her own where book making and drawing are explored in various ways. In this class we will make a precious round accordion book with buttons for covers, and a lovely map fold inspired by vintage advertising. Participants are encouraged to bring any patterned paper, artwork, photographs, or paper ephemera dear to them to decorate their books. Jill Osgood was born in Westmoreland, New Hampshire in 1960. Growing up in the woods of New England, her parents instilled within her a sense of wonderment and respect for the natural world that has guided her perspective as a human being and defined her work as an artist. In 1980 she moved to Portland, Maine to attend art school. She has lived and worked in Portland ever since, continuing to make art and growing deeper roots in Maine. In 2017 she received her BFA with honors from the University of Southern Maine with a concentration in painting and a minor in book arts. Jill is thrilled to share her knowledge of paper craft as a teacher, most recently working with Portland first graders via the non profit Side x Side. Currently she is enrolled in the year long intensive Maine Master Naturalist Program, delving deeper into Maine’s remarkable flora and fauna. Having the opportunity to cultivate an appreciation and knowledge of art while encouraging curiosity to students of all ages is Jill’s primary desire. This workshop is a basic introduction to paper marbling with acrylic paints. It includes paint, bath and paper preparation. Participants will marble in full-size professional trays and will learn how to use a series of precision marbling combs to create papers in a dazzling array of patterns and colors. One day of marbling is never enough, but it is guaranteed to bring joy! Dan and Regina St. John at Chena River Marblers, are practitioners of the art of marbling. This wondrous process involves the capturing of an intricate pattern from the surface of a liquid. The marbler creates these patterns by applying and manipulating colors on the liquid’s surface until the desired pattern is established. The pattern is then caught permanently when paper or fabric is briefly laid onto the surface of the patterned liquid. Each marbled piece is one-of-a-kind as the marbler must start afresh for each new print. Apron and wear studio appropriate clothes. Very comfortable shoes are important as there is a lot of standing. Please also bring your lunch because there is nothing on campus available on Saturdays.